When I directed the High Tech Law Institute, slinkies were my schwag of choice. With the peaceful transition of HTLI leadership to Brian Love, our schwag of choice changed to…bobbleheads. Two years ago, the HTLI produced a bobblehead of Federal Circuit Judge Randall Rader. Last year, it was USPTO chief Michelle Lee. And this year…well, it’s me. Before we celebrate the bobblehead, I do need to clarify the backstory and my (lack of) involvement in choosing the bobblehead’s subject. I can’t claim to be completely modest, but it would be Trump-level self-aggrandizement (i.e., more than I have) to direct or ask my organization to make a bobblehead of myself. Instead, Brian and the HTLI team cooked up the scheme while I was out of the office on sabbatical last year. As a result, I first learned about the bobblehead when I saw the final product about 2 weeks ago. Also, the prior two bobbleheads were produced with the permission and cooperation of the subjects, which didn’t happen here due to the secrecy. 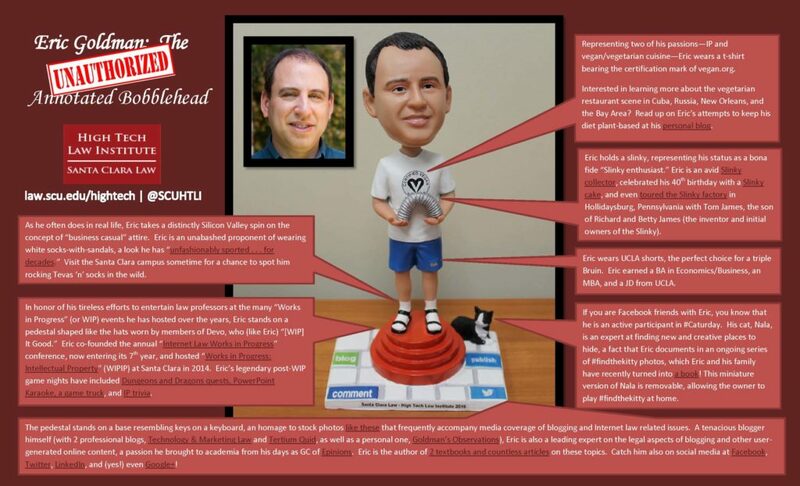 When I first saw the bobblehead, I joked that I should sue the school for publicity rights violations; and Brian ran with the gag by drafting a mock complaint. (I trust most of you know me well enough that it would take a lot more than this to turn me into a plaintiff). We thought about including the mock complaint as part of the bobblehead announcement, but Brian instead added the “unauthorized” legend to the bobblehead annotations and I’ve dropped my litigious threats (for now…[cue ominous music]). Now that we’re past the self-referential implications, I can’t tell you how honored I am to be bobble-ized–and to join the ranks of Judge Rader and USPTO Director Lee, two true legends in our field who have been an inspiration to me. My mom would have been so proud! The bobblehead itself is a delightful treasure. Brian and the HTLI team did an awesome job capturing the real me–with the obvious exception of the bobblehead’s full head of hair, a flattering homage to an earlier phase of my life. The bobblehead’s features and annotations reflect Brian’s characteristic wit and whimsy. I didn’t get the chance to veto any details, but I wouldn’t have changed a thing. While the world might be a better place if everyone had their own personal Eric Goldman bobblehead to enjoy, bobblehead production was extremely limited. Not only is the bobblehead special, but it’s very, very rare. If you want your own personal mini-me, you’ll have to win it by following the instructions here. (Bonus caveat: I’ve not been involved in doing the legal clearance for this promotion, and it might provide fun facts for a future Advertising Law exam). GOOD LUCK! I, for one, would love to see the proposed complaint. Not that I would ever, ever be tempted to use such a complaint.